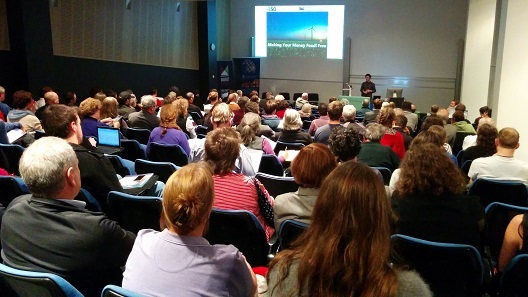 On 29 May and 3 June 2014, Market Forces, in conjunction with 350.org and the Australia Institute, ran forums in Sydney and Melbourne to release a new report examining how individuals can make their personal finances fossil free. A summary of the report’s main findings can be found on the Market Forces website as well as the complete report. The panel at the Sydney event consisted of Tim Buckley (Institute for Energy Economics and Financial Analysis),Tom Swann (The Australia Institute) and Trevor Thomas (EthInvest). In Melbourne the panel consisted of Jemma Green (Carbon Tracker), Dr Stuart Palmer (Australian Ethical Investment), Tom Swann (the Australia Institute) and Simon Sheikh (Future Super). Each panellist spoke for about ten minutes before the Q&A session with the audience commenced. More than 120 people attended each forum and there was a great level of energy in the room. The Q&A session went over time due to the number of questions from the audience about the rapidly growing fossil fuel divestment movement. If you are interested in finding out more you can watch a video recording of the Sydney forum or listen to an audio recording of the Melbourne forum.